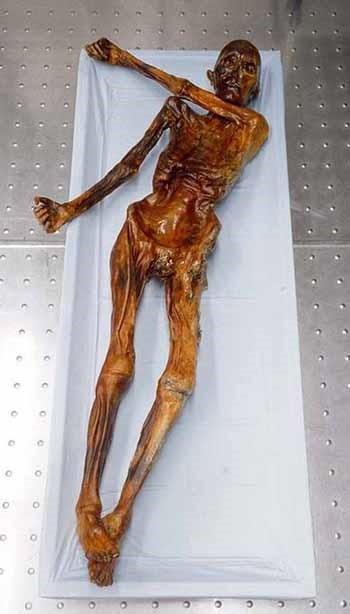 Since his 5,300-year old mummified body was discovered in the Ötztal Alps between Italy and Austria in 1991, Ötzi the Iceman has been studied in incredible detail by researchers. Not only have they found that the ancient European was between 40 and 50 when he died, they discovered that he was murdered. Just in the last year, researchers have revealed what the ice man wore, what his voice may have sounded like and that he had calcification in his arteries. A look at his stomach contents in 2011 showed that the ice man’s last meal consisted of cooked grain and meat from an ibex, a type of wild goat. Now researchers say that further testing shows that it wasn’t just goat meat—Ötzi’s last meal included goat bacon. The Local reports that Albert Zink, a mummy specialist from the European Academy of Bolzano analyzed the goat meat found in Ötzi’s stomach. Looking at the nanostructure of the proteins, he was able to determine that the meat had never been cooked. Instead, it was dry-cured, making it into a product similar to prosciutto. Zink points out that Ötzi was not carrying a bow and arrow with him while traveling in the mountains, meaning it was unlikely he was hunting fresh meat. Raw meat would probably spoil. So it makes sense that the ice man traveled with cured meat. “It seems probable that his last meal was very fatty, dried meat—perhaps a type of Stone Age Speck or bacon,” Zink tells The Local. But that’s not the only secret Zink has pulled out of Ötzi’s tummy. In a study that appeared in Science earlier this month, Zink and his team also found the oldest known Helicobacter pylori bacterium in the ice man, the pathogen that has been linked to the development of ulcers and gastric cancer. According to Laura Geggel at LiveScience, the researchers took 12 biopsy samples of Ötzi’s stomach and intestines, then separated out the various strains of H. pylori found in his food, the soil he was exposed to and the bacteria that infected the ice man himself. They isolated the pathogen, finding that Ötzi had a particularly virulent strain of the bacteria, and that the ice man likely had a reaction to the bug, as do one in 10 people. That meant he may have suffered from ulcers or stomach problems as a result. The H. pylori also helps researchers track migration of people into and out of Europe. The fact that Ötzi had a strain that Europeans share with Asian populations and not the North African strain most people have today, reports The Local, means the populations probably had not mixed yet significantly. “We can say now that the waves of migration that brought these African Helicobacter pylori into Europe had not occurred, or at least not occurred in earnest, by the time the iceman was around … 5,300 years ago,” Yoshan Moodley, a professor in the Department of Zoology at the University of Venda in South Africa and co-author of the study says. And while Ötzi might have been fond of charcuterie, researchers found that he didn’t order the cheese plate—The Local reports the analysis also showed that he did not have any dairy products in his stomach at the time of his death.